In this predominantly Roman Catholic country, expect the majority of Filipinos to go wild at the impending arrival and presence of the spiritual leader of the 1.2 billion Catholics, the amazingly affable and austere Pope Francis. As we all know, this would be the fourth papal visit to the Philippines: Pope Paul VI visited in 1970, and Pope John Paul II did it twice in 1981 and 1995. And as always, here are some interesting facts about the prior papal visits to the Philippines. 1. 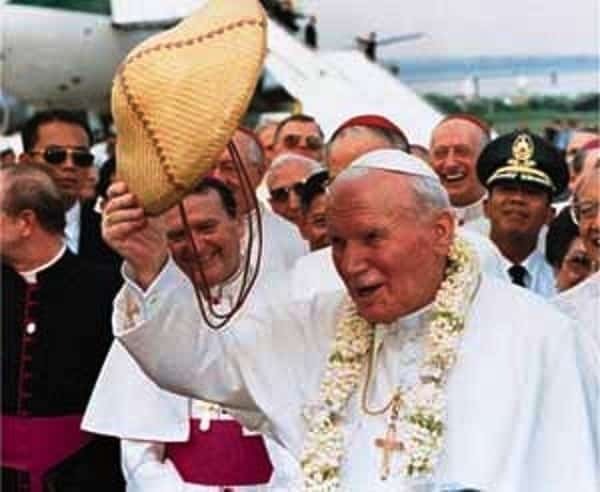 Before He Became Pope, John Paul II Had Already Visited The Philippines. 2. A Bolivian Painter Tried To Kill Pope Paul VI. 3. 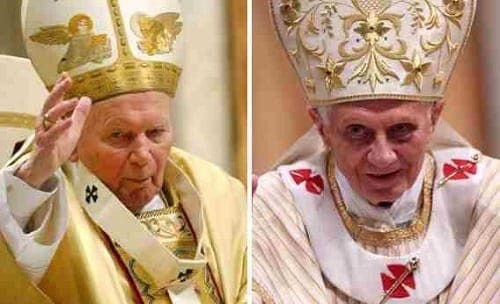 The Plot To Kill Pope John Paul II With A Suicide Bomber. 4. Pope John Paul II Would Have Visited The Philippines A Fourth Time. 5. Two Popemobiles Are 100% Proudly Filipino-made. 6. 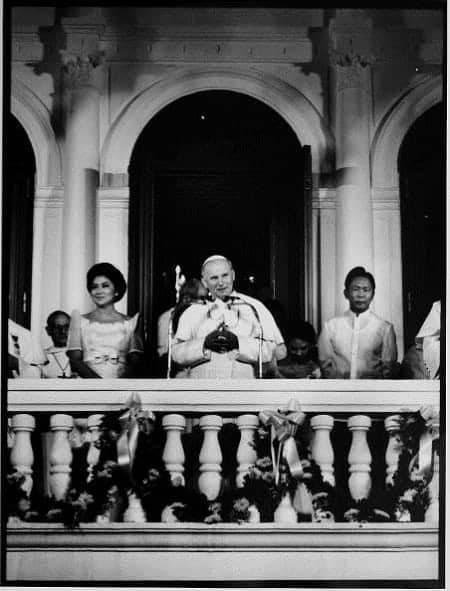 Pope John Paul II Criticized President Marcos In Front Of The World. 7. It wasn’t just President Marcos whom Pope John Paul II criticized. 8. 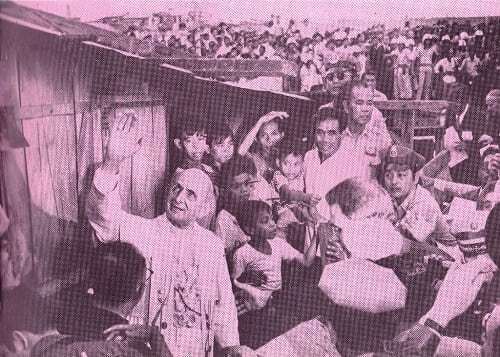 Pope Paul VI Also Visited After A Typhoon. 9. Two Papal Gifts Are Landmarks In Luneta Park. 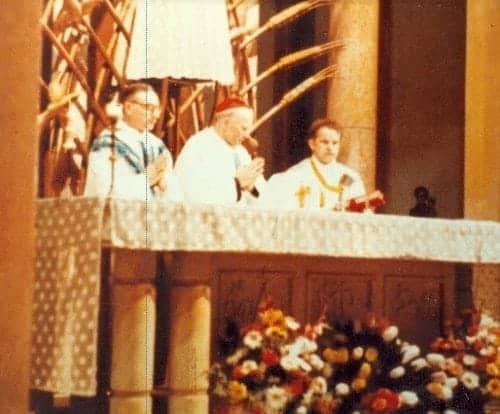 Karol Jozef Cardinal Wojtyla (now Pope John Paul II) at the Baclaran Church in February 1973. Aside from his famous 1981 and 1995 visits to the Philippines, Pope John Paul II already came to the country in 1973 when he was still the relatively-unknown Karol Jozef Cardinal Wojtyla, the Archbishop of Krakow. Arriving in the country for a stopover, the future pope hardly attracted attention when he celebrated Mass in Baclaran Church in Parañaque. Yet to those who were privy to the Vatican’s internal affairs, they already had a gut feeling that Wojtyla would someday be pope (they were correct). Christer Nyblom, a Swedish journalist attached to Wojtyla’s entourage at the time, also noted how the pope-to-be loved to indulge on Philippine mangoes and San Miguel Pale Pilsen during his first brief stay here in the Philippines. Notwithstanding the generally warm welcome he received when he arrived in the country, Pope Paul VI almost lost his life in the few minutes he had stepped Philippine soil. Disguising himself as a priest, Benjamin Mendoza, an eccentric Bolivian painter, managed to reach the pope as he was being welcomed in the airport and stab him twice in the chest with a 13-inch knife before being finally subdued and carried off by security forces. During his arraignment and trial, he rambled on and off about only inflicting a “symbolic death” on the pope and that he never meant to actually kill him. He eventually spent four years inside a local prison before he was deported back to his homeland. Meanwhile, President Marcos was said to have credited himself with saving the pope’s life by giving a “karate chop” to Mendoza’s knife-wielding arm. However, his life-saving role was never confirmed by the pope’s entourage. Pope Paul VI himself never spoke about the attack in his lifetime and instead forgave Mendoza. He also denied he had been physically injured although, after his death, the Vatican revealed he had a chest wound which would have killed him had it not been for the undershirt he was wearing during the attack. In his silence, Pope Paul VI ironically saved Mendoza from being executed. Although we’ve already discussed the Bojinka Plot which was the precursor to the 9/11 attacks, we’ll go into the further details on how the plotters planned to assassinate Pope John Paul during his 1995 visit. Supposedly, the terrorists would employ a suicide bomber disguised as a priest to come near the Popemobile as it made its way to Makati City’s San Carlos Seminary and assassinate the pope. However, killing the pontiff would be a mere diversion for the real goal of the terrorists—to hijack several planes and either detonate or ram them into several US buildings including CIA headquarters and the Pentagon. Unfortunately for the terrorists, their cover was blown when an accidental fire in the apartment they had been renting attracted the attention of authorities, resulting in the arrest of three of their principal members and the dissolution of the plot. If he didn’t have become sickly during his final years, Pope John Paul II would have visited the Philippines for the fourth time (we counted his visit as an archbishop). The pontiff was supposed to have been in the country for the World Meeting of Families back in 2003 but had to back out due to his frail health. On the other hand, his successor, the conservative Pope Benedict XVI turned down three invitations to go to the Philippines in 2010. 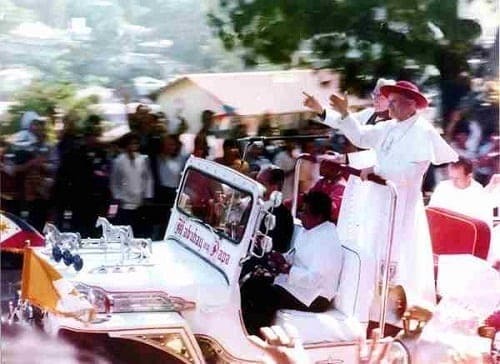 When Pope John Paul II came to the Philippines twice, he used Popemobiles (the unofficial name of the vehicles used by popes for outdoor appearances) that were designed and created exclusively by Filipinos. For the first visit, Sarao Motors created a customized Popemobile designed from a jeepney. As for the second visit, Pope John Paul II rode in a bulletproof pick-up truck designed by Francisco Motors. At the time of his second appearance, security measures had already been tightened due to a failed assassination in St. Peter’s Square in 1981. 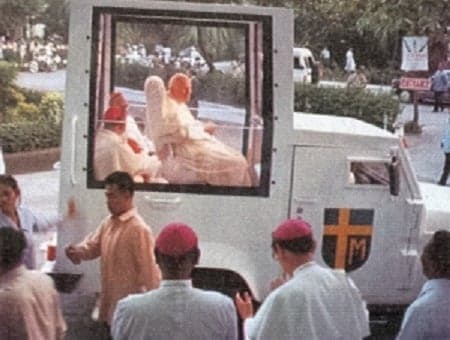 A rumored second attempt (the Bojinka Plot) against the pontiff in the Philippines also spurred the designers to make the vehicle as safe as possible, hence why bulletproof enclosures were placed on the vehicle. 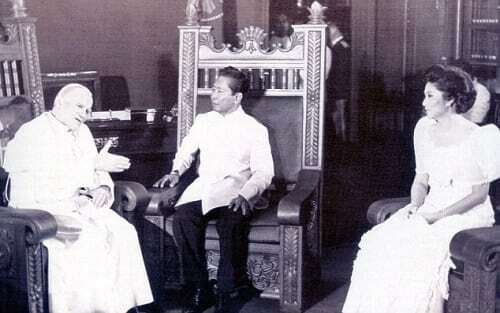 In a time when criticizing President Ferdinand Marcos would have meant certain death, Pope John Paul II did it anyway, and in front of the iron-fisted ruler himself. Although Marcos had already lifted martial law prior to the papal visit, he still practically retained his dictatorial powers. During a press conference in Malacañang Palace and with the president sitting beside him, the pope minced no words as he candidly spoke about how there could never be a justification for violating someone’s human rights or trampling on his dignity. His frankness caused Marcos to abandon his carefully-prepared speech and apologize to the pope for what he described as “petty and small” conflicts between the church and the state. After talking down Marcos, the pope flew to Negros and essentially repeated his speech due to what he perceived as the inhumane conditions tens of thousands of “sacadas” (sugarcane workers) were experiencing at the expense of the few hacienderos who controlled the province. His wife, Imelda—who had by then gained a reputation as a free-spending First Lady—also incurred papal criticism when she commissioned the building of the Coconut Palace (yes, the very same Coconut Palace which now serves as the official residence of the Vice President). At the time of its construction, the Palace cost the country P37 million pesos—a humongous amount given the sorry state the country was in at the time. The pope must have agreed too because he refused to stay inside the Palace he described as ostentatious and instead resided elsewhere for the duration of his 1981 visit. Just like Pope Francis, Pope Paul VI’s visit also came after a powerful typhoon named Yoling devastated the Philippines. Overcoming the protests and reservations of the Marcos government, the pope spent a Sunday afternoon wading through the mud-riddled slums of Tondo and ministering to the residents. He also spent more than an hour staying inside the shack of a family with ten children just to talk to them. At the end of his tour, Pope Paul VI was said to have been deeply moved by the poor people’s plight and delivered a stirring speech calling on the government and the local Church to recognize their worth as human beings and uplift their lives. His successor, Pope John Paul II, would also visit Tondo in 1981 where he would invoke his famous “First Beatitude” speech. Unbeknownst to many, two landmarks in Luneta Park were gifts by the two visiting popes when they visited the country. The first, a four-decades-old Narra tree, was personally planted by Pope Paul VI in 1970. 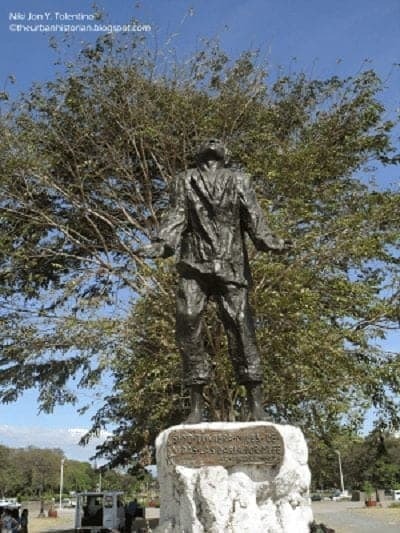 The second, a statue of St. Lorenzo Ruiz and which can be located in front of Pope Paul VI’s tree, was donated by Pope John Paul in 1981 to commemorate the beatification of the saint. Not only that, but he also planted his own Narra tree. Unfortunately, park attendants have had to remove the markers on the papal trees to dissuade devotees from damaging them.